On my last post “Local Search for businesses” I explained what it is, why is important for all companies and how to set it up. What I did not include in the post was the overwhelming data that further proves the benefits of having your local business search optimized. The infographic below (from Balihoo) has great data about the benefits of local search optimization. A Stat you should know: 70% of adults in the U.S. rarely or never use the phone book. Most of them (60%) use the internet to find contact information. While only 59% of PC searches resulted in a purchase, 78% of mobile phone searches and 77% of tablet searches led to buying. 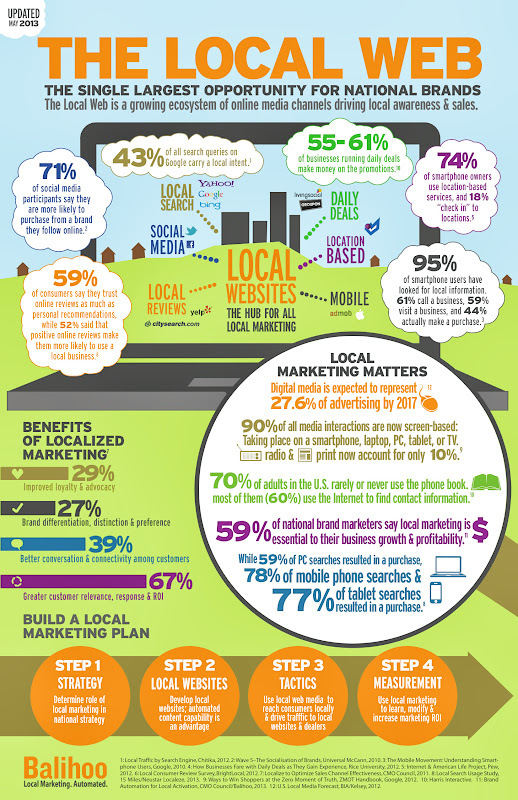 I hope this infographic shows you how important is the local search for your business. Let's face it; the yellow pages don't exist anymore, and newspapers with their classified ads are on the way out. What is replacing them is local search, and most people are searching for your business on their phone.